History in Hollywood takes no time to build. The Kodak Theatre is is just over 11 years old, and was designed to be a permanent home for the Academy Awards. 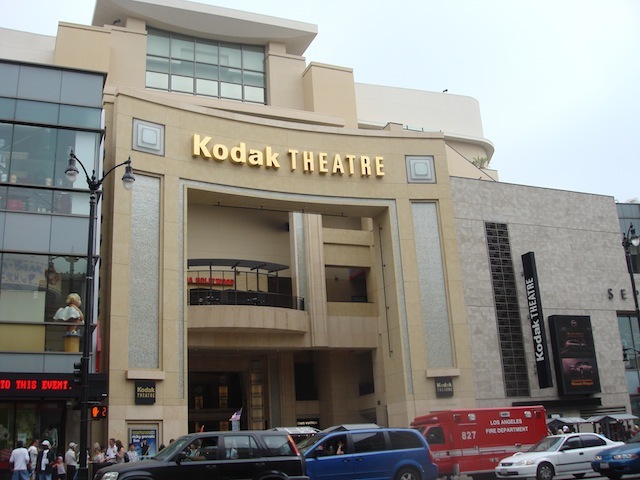 Kodak’s contract has them paying $75 million over 20 years for the privilege of having its name appear in guilded letters over the grand entryway to the theatre. That’s $3.75 million a year, nothing to sneeze at for a bankrupt company, and now they’re looking to get out of their contract, opening up the naming rights to anyone else with a big enough wallet. The news has created a string of discussions, online and off, pontificating over the future of the theatre, especially with the added detail that the Oscars may be looking for a new venue. These discussions are laden with nostalgia for the theatre, its name, and its “history” as the venue for the Oscars. Councilman Eric Garcetti is asking for suggestions for who might take over the the naming rights, and as one would expect, the suggestions put forth in tweets and comments are mostly tongue-in-cheek. I have to say I love the phrase “Hollywood awareness”, both for its oxymoronish nature, as well its idealism. I dare say, I possess Hollywood awareness – that is, I am a strong advocate for the neighborhood, and am very dedicated to defending its character, and to helping improve its (already significant) quality of life in any small way I can. The “D.W. Griffith Theatre”with its call-back to our local culture’s rich, if short, history is the perfect name for the soon-to-be former Kodak Theatre, but the question is, who would pay $75 Million for it, and where does that money even go? Where does that $$ go? I love the notion of 'Hollywood Awareness', and completely agree that you absolutely are an advocate for your community.